These USB flash drives come complete with soft PVC composition that makes them comfortable to wear on any wrist of ankle. 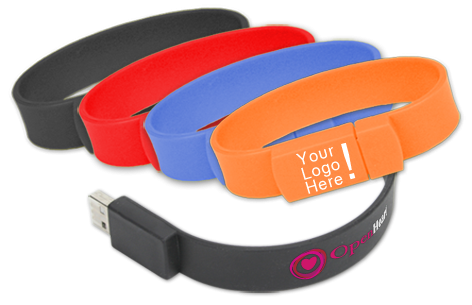 While most memory sticks are easy to lose and forget, our USB Wristbands are available in multiple colors and with your logo printed directly onto the wristband. These aren't your average pen drive, and are perfect for handing out for promotion at any event you can imagine. A stylish product to promote your brand, music or product! Promote yourself or your brand with this cool and extremely portable drive. Connects around a wrist or ankle and is made of soft PVC for added durability and comfort. Silkscreen printing for one side is included. Two sided printing is available for an additional charge. Special Features: No-lose cap, easily worn!